Kostroma may surprise you at first, but the town grows on you. 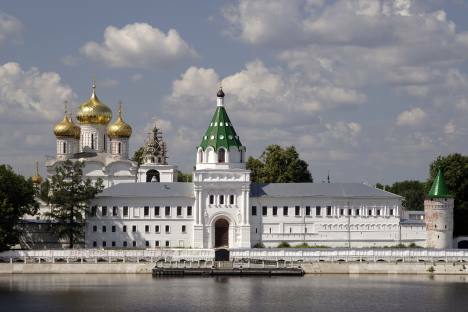 Kostroma is a river port, a light-industry center and a serene spot on the Volga River. Life is calm and quite uneventful outside production facilities, though there is always time for street festivals, new people to meet and a special ambiance to enjoy. There are three ways to reach Kostroma: by train (eight hours, $40 one-way from Moscow), by bus along Yaroslavskoe Highway (five hours, $20 one-way from Moscow), or by plane from either Moscow or St. Petersburg to Sokerkino Airport (about 40 minutes, $65 one-way from Moscow). Like any other Russian town, Kostroma looks its best in the summer. If you’re looking to have a proper tour of Kostroma, you should stay overnight. If you go by bus, you will surely drive across the Kostroma Bridge, which is almost 5,000 feet long. The Volga is a favorite place for Kostroma residents to promenade: In the summer it offers a cool breeze and sites for barbeques, whereas in the winter it provides a breathtaking panorama of Russian log houses and birch trees covered in ice and snow. Behind the medley of wooden houses stand standard Khrushchev-era apartment blocks, 1970s’ houses with load-bearing walls, modern gas stations and towers. Wooden sheds with old boilers remain in some back yards: outdated gas tanks heat a cast-iron boiler, which delivers heat to all the radiators in the house. Roga i Kopyta is a café with a most attractive interior in the historic town center (2a Sovietskaya Street). The designers made use of items and characters from the classic Soviet satirical novel, “The Twelve Chairs,” written by Ilf and Petrov. European desserts and pastries (cheesecake and tiramisu) become pie and crème brûlée; plus, local pancakes with a variety of fillings are served here ($2–2.60 per dish) and widely considered to be the best in town. The cafés and cars are never crowded, so you can always relax. In Roga i Kopyta, you can also listen to soundtracks from your favorite Russian films. Sovietskaya Street is Kostroma’s main street. It features shops of local manufacturers, cafés, restaurants, shopping centers and theatres. The main square on Sovietskaya Street is named after the Russian national hero Ivan Susanin, but the locals call it the “frying pan” (“skovorodka” in Russian). It is believed that, in the 19th century, horse-drawn carriages went around the square so many times that a perfect, smooth circle was formed – precisely resembling a giant frying pan. Streets radiate from “Skovorodka” in various directions, in a fan shape: A wealthy merchant used to live on each street a few centuries ago, and he had no other merchants to compete with him on the same street. They all took their merchandise to the shopping gallery, which still exists. The old shopping stalls, dating back to the late 18th and early 19th centuries, occupy a few blocks in central Kostroma. The arcade (which is what they normally call the shopping gallery’s stalls), with its smooth floors made of stone flags, bright signboards and shop windows, were not only the center of busy commercial life but also a place for Kostroma residents to meet. The stalls are now occupied by small shops and cafés. They were originally built in two levels – one for the warehouse and another for the shop. After renovation, little was left of the original buildings in the shopping arcade, but this is still where you will find the best shops in town. The people of Kostroma work in linen, jewelry and woodworking factories, just as their forefathers did before them. The most popular places to buy or admire local handicrafts are the Linen and Birchbark Museum (38 Tereshkova Street) and the Show Room of Kostroma Jewelry Factory (27 Second Volzhskaya Street). Here you can buy jewelry, linen table cloths, wooden whistles and other typical Kostroma souvenirs. Compared to Moscow and St. Petersburg, chefs in Kostroma seem to take forever to cook your meals, and natives will appear terribly slow or maybe even lazy. People stroll in the streets and back yards, often stopping for long conversations and taking their time to look around them: bustle is definitely the wrong word for Kostroma. Yet, as in all Russian towns, local youngsters never sleep at night but populate the Kostroma dance floors instead. If you walk around the town until late at night, you can have a bite at the 24-hour Lakomka pancake house (61a Sovietskaya Street), which survived all of Russia’s economic upheavals by way of support from the local factory. A pancake and an egg with tea and honey is just $.90, and for $2.60 you can have a sumptuous dinner. Khrushchevka, one of the most popular bars in town, is close to the town center (Sovietskaya Street, 1 Krasnye Ryady). Try the traditional Russian cuisine at local prices (salads and second courses are all within $5.20), watch Russian cartoons, play draughts, backgammon, chess, solve a Rubik’s Cube. You can also dance on any flat surface in the bar on weekend nights. The interior is designed in the Soviet style: Retro furniture and accessories (either very well preserved or restored) make the bar look like a luxury, Soviet apartment back in Nikita Khrushchev’s time. Darling, Don’t Wait Up is another bar for younger audiences (2/15 Nizhnyaya Debrya Street). Business lunch starts at $5.20 and hardly any of the dishes on the menu cost more than $6.50. The name of the bar gives you an idea of what goes on inside: local DJs play until 4 a.m. and guests never want to leave. Even in the center of Kostroma, most of the shopping centers and stores close at 6:30 p.m., with just a few open until 10 p.m.
To have fun, you should take a taxi ($2.60 will take you anywhere) to the linen factory district to see one of the shows at the Stantsiya art venue (3a Yerokhova Street). Stantsiya cooperates with many organizations and regularly arranges themed parties and performances, shows foreign films with Russian subtitles and hosts discos. Kostroma is the native town of “Snegurochka” (“the Snow Maiden”), who is known as the granddaughter of the Russian Santa Claus (called “Father Frost”). A large log-house was built at 38 Lagernaya Street, with an ice room where the temperature never rises above 7 degrees Fahrenheit. Snegurochka’s assistants are house elves and Cat Bayun, who take care of the house when Snegurochka is away, act as guides for tourists and tell fairy tales. You should also visit the town’s two large monasteries: Holy Trinity Ipatievsky Monastery and Bogoyavlensky Anastasiin Cathedral. The two churches have icons that have been recognized as miracle-working artifacts by the Russian Orthodox Church. You can have dinner in a refectory for less than $5. A 30-minute drive from Kostroma will land you at an elk farm in the village of Sumarokovo, where they have been breeding young stock, keeping adult elks and studying the biology of the species since 1985. You can take a tour of the farm, feed the elks and drink elk milk for a fee of $9. Kostroma is so small that you could walk across the town in half an hour. Whatever route and sites you choose, you should remember two things: get information about local events, because there is always an open seminar or a concert in Kostroma. In addition, do not believe vendors with carts: A fresh cake is one that has just been baked, not delivered.